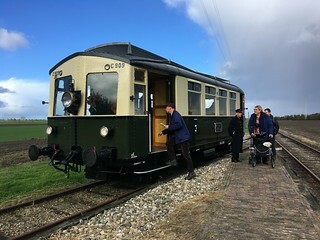 An ad in Bluebell News had caught my eye - a trip to Bluebell Railway's twin, the Museumstoomtram at Hoorn on the Zuiderzee in Holland, which is celebrating its 50th anniversary. When I received the itinerary however, I saw it included two of my pet hates: getting up early, and travelling by train on a Sunday! Ah well, its only once a year, so on Tuesday 23 October it was up at 4am, and an Uber to the station for the 5.47 to St Pancras, where I bought a sandwich at M&S (not needed!) and joined the Going Dutch party in the Eurostar departure lounge. We'd been booked Standard Premier (First class? ), so breakfast - and a beer - was included... the first of many meals. It was the direct train to Amsterdam, but we got off in Rotterdam to visit Mini World, a giant model railway and docks, with a GB exhibit under construction. It works on the principle of 1 minute = 1 hour, so every now and again it goes dark and the buildings light up. Then was back to the station for a first class train to Amersfoort, where we were staying for three nights in the rh Hotel, where we had dinner. We travelled by train to Apeldoorn to join the Veluwsche Stoom Trein, pulled by a giant German loco, 23 076. We had the Wagon Lits to ourselves and were greeted with a huge slab of apple cake for elevenses. This was followed shortly by lunch: soup, mushroom vol-au-vent, cheese rolls and fruit cake! 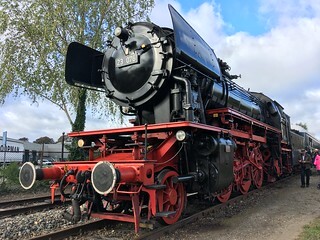 On the way back we stopped at Beekbergen where the loco took on coal and water, and we got to see lots of German locos. Back at Amersfoort we had a snail's-pace walking tour of the older parts of the town, including De Drei Ringen brewery where we enjoyed some of their Dubbel and the obligatory cheese. Then it was to Restaurant Dara, for a middle-eastern 'tapas' (mezze?) comprising an enormous number of dishes that kept on coming. 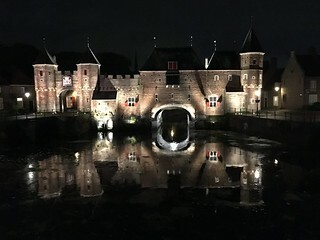 The walk back took us past the medieval bridge all lit up. Another early start and it's the train to Utrecht Railway Museum. 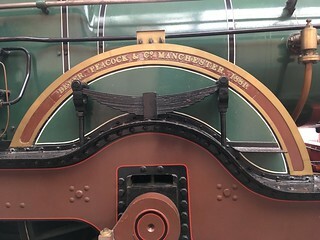 After tea and biscuits in the old station we were let loose in the museum, which is more like a theme park, with a dark ghost train, a rollercoaster runaway train 'flight simulator' and a trip 'down a coal mine' in a rickety wooden lift. 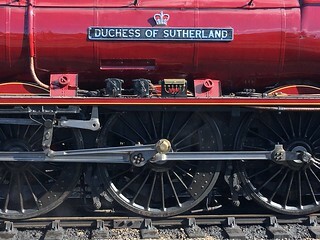 Lots else to see, including many locos built in Manchester. After a lunch of cheese rolls and soup, it was a short walk to the canal and a boat trip on Domstad round the waterways of Utrecht. The final destination was Oudaen Castle with its brewery and restaurant. Then it was back to Amersfoort for our final night there. 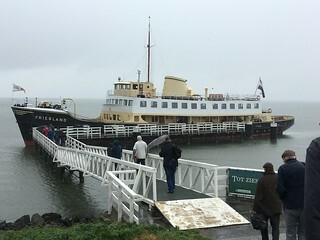 It was first class again to Hoorne via various diversions, and after dumping out bags at the station, boarded a steam tram to Medemblik to catch the MS Friesland for a rainy day cruise to the Open-Air Museum at Enkhuizen. 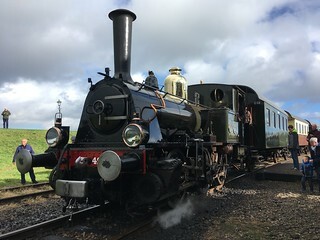 The Museumstoomtram is more like a light railway, with three steam locos in operation (6513, 7742 and 8107) plus a diesel railcar. At a different time of year, they'd be puffing through tulip fields, but this time of year it's cabbage and cauliflowers! The Zuiderzee I discovered is a fresh water lake, not the sea! At the Open-air museum, we checked out the steam laundry and the smithy and had coffee in the bakery. The post office even sold real stamps (€2.10 for a postcard to UK). We didn't have time to see the indoor museum and it was a long walk to Enkhuizen station - there were shuttle boats apparently. Thankfully, the Petite Nord Hotel was not far away and we checked in and began the long walk (for me) to the restaurant Steak and More, by the harbour, which provided me with a tuna steak! Technically a free day, this was a whole day on the MSHM, with a packed lunch provided. 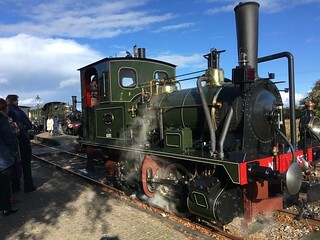 So it was down to Medemblik where I took a photo of MS Friesland in the sunshine, then caught the railcar for one stop then back on the next train to Medemblik them finally back to Hoorn stopping off at Wognum to take some pictures of the trains. The Dutch like to put on a performance, so little acts of theatre were enacted at the various stations, getting the kids involves carrying parcels etc. My plan was to catch the Hoorn tourist bus (golf cart) to the harbour and the Museum of the 20th century but couldn't find it. So it was back to the hotel and thence to Barrels Pub for a Bock. 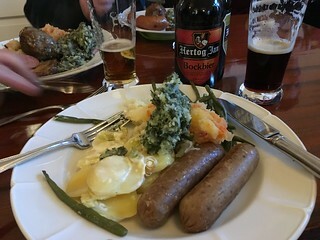 There was more bock back at the station where we were treated to a slap up dinner of various stamppot with a couple of veggie sausages for me! 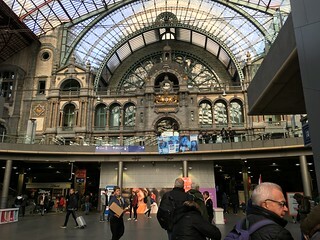 Lots of changes today: Hoorn > Amsterdam > Rotterdam > Antwerp (the most beautiful station in the world?) 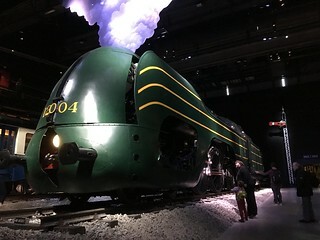 > Schaerbeek, where we visited Train World (my second time), to reacquaint with Atlantic streamliner 12.004. and had a lovely farewell meal in their RN Express cafe. Then it was back on the train to Brussels Midi, and on to the Eurostar, economy class this time! At St Pancras, the Thameslink trains were only going as far as Three Bridges, but outside the station it was well organised with queues for various destinations, including an express service to Brighton. I walked home from the station, getting in around midnight and after a day turning back the clocks twice! I must say this was one of the best organised trips I've been on, thanks to Roger Price of the Bluebell. The only money I spent was on the odd beer, postcards and stamps. It was as if I'd given a wad of money (just over a grand) to a butler or concierge and said show me a good time. 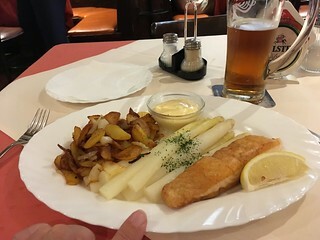 I did things I'd never do travelling solo, such as going first class, and staying at posh hotels, eating at posh restaurants. 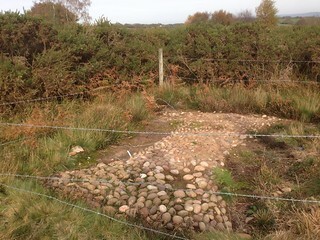 It was tiring and intensive, with a little too much walking for me, but I now have lots of happy memories. Much more entertaining than I expected! It's always good to get some jeopardy at the start of an ambitious itinerary, stops you worrying about connections etc. The Thameslink timetable fiasco had one silver lining - tickets were valid on Gatwick Express trains, but I'd still have to get the tube from Victoria to St Pancras at rush hour. However on the morning TV news they said a train had broken down at Gatwick Airport and to expect delays... so, I set off straight away. Made it. The other major worry was right at the end of the trip when the German ICE train from Cologne to Brussels arrived 45 minutes late, and on another platform! By the time we were detoured because of people on the line, we arrived 1hr 21minutes late. 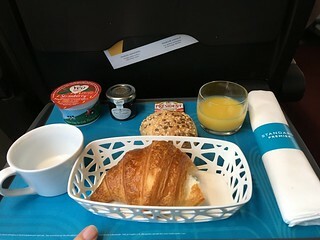 Of course I'd missed my Eurostar and I was imagining all kinds of scenarios - staying the night in Brussels, buying new tickets and claiming back on the holiday insurance, etc. I needn't have worried - the Eurostar check in person just booked us on to the next train. Back at St Pancras, a Thameslink train turned up and I got back to Brighton in time for the last train to London Road. Phew! So when people say the trains always run on time in Germany? That was a long time ago. 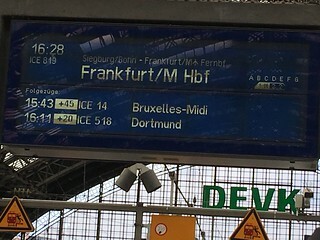 There was another delay from Cologne to Hamburg when a thunderstorm caused the train to be late by about 50 minutes, but as Hamburg was that day's destination, no connection to worry about, just a late night. Apart from that, there was one other change to the plan. The train from Hamburg to Copenhagen was meant to drive on board a ferry (yes, the train went on the ferry, like the old Golden Arrow). Only it didn't - the train terminated at Puttgarden, we got onto buses, the buses drove onto the ferry for the 45 minute passage, then we rejoined the buses to travel all the way to Copenhagen Central station (mind those cyclists!). I had to get to Nørreport station for the shuttle bus to the ferry port, so I bought a ticket from a machine using my card, was directed to platforms 9 or 10 by a helpful member of staff, and a local train came straight away. Getting across cities from ferry port to station was a major worry - if I ruled the world, there would always be a bus linking station, town centre, ferry terminal, and major tourist sights. Like there isn't in Bergen! Bergen of course was the highlight of the holiday. 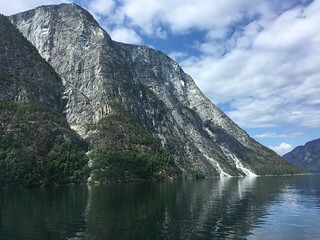 I'd originally thought of going on a cruise up the fjords, but a) thought I could do it cheaper, and b) didn't want to be cooped up with all those Daily Mail readers. Two overnight, reasonably sized ferries were enough for me! So I googled 'steam railways in Norway' and found the Old Voss railway with its 1913 4-6-0 loco. Digging deeper, I found that about six times a year it featured in a Heritage Tour, comprising a steam ship (also built in 1913) SS Stord 1, the aforementioned steam train and vintage buses. At around £40 this was the bargain of the week. The whole holiday was built around this Sunday event. I arrived far too early at the steam ship - the ticket said 10am, I arrived at 9.30am but the actual sailing wasn't until 11.15am. The Stord I was delight - we could go anywhere - on the bridge, even down some greasy metal steps to the engine room, where a Cheshire built steam engine could tear your limbs off. No stoker, it was fuelled by oil! 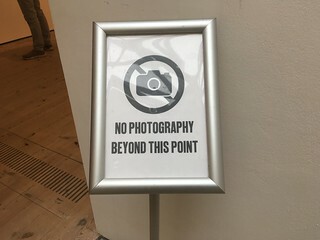 On the Monday I'd booked another tour - Norway in a nutshell. This involved an early start to collect the tickets for my self-guided tour from the station, and as stated earlier there didn't seem to be a bus or tram linking the area of my hotel at the harbour fish market to the central station. Found it and joined the queue. First leg was a trip up the Bergen-Oslo railway I'd travelled down on. 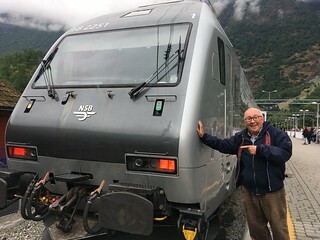 You could take the tour in any order and I was delighted when most of the train got off at Voss. 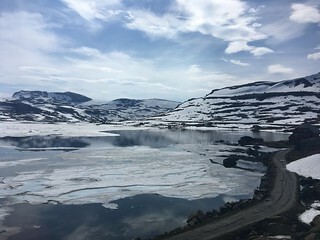 The rest of us carried on to Myrdal where we climbed aboard the Flåm Express for a scenic journey down to the fjord. 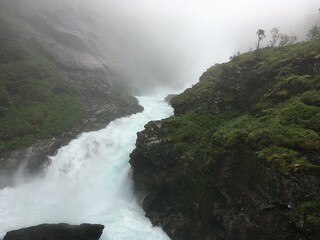 The start was in the clouds, but we stopped at a waterfall and were encouraged to get out... to our surprise, music started and a faraway Huldra in a red dress did a dance up on the rocks. 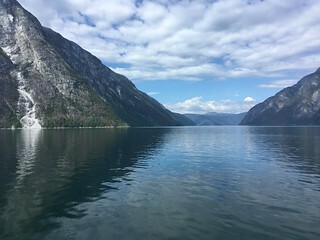 At Flåm I visited the museum, gasped at the huge cruise ship in the harbour and got on our modest ferry to sail down two beautiful fjords. I was surrounded by Taiwanese girls ('Were not Chinese! We hate the Chinese'), so didn't get out on deck. 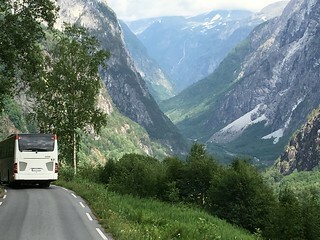 At Gudvangen we got onto buses for a truly hair-raising descent into the Nærøydalen valley via 13 hairpin bends and two waterfalls. It is one of Northern Europe's steepest roads, and the driver took it very slowly! 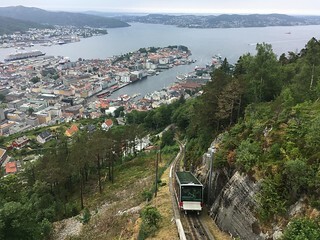 Other highlights included the Oslo to Bergen train line itself - very scenic with ice and snow, but lots of tunnels - and the fabulous Fløibanen Funicular. It wasn't working the first night, but was the second night - and at 10 quid, well worth the experience. The ferry from Bergen to Hirtshals was great too, especially since I had a porthole! I'd prebooked the Commanders Buffet at 30 quid and did my best to consume as much seafood and Carlsberg the 90 minutes allowed. I watched a covers band called Waterproof until time for bed - my taster of life on a cruise ship over. First, a big thank you to The man in Seat 61 for the invaluable info on getting anywhere by train. 16. Steam ship SS Stord I from Holbergskaien to Garnes. 37. 11.41 Seaford train to London Road, and home. 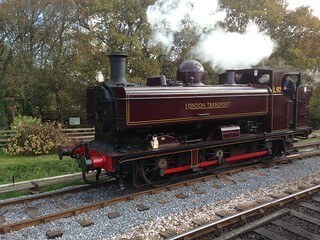 End of October is when most heritage railways pack up for the winter, and get ready for the Santa Specials. 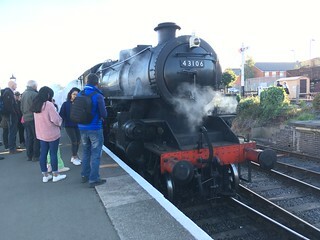 The South Devon Railway was having a half-price weekend to commemorate the clocks going back, so I travelled down to Torbay on Friday 27 October to get me some steam action. 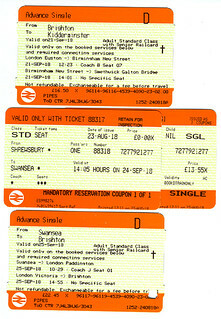 The trip involved changes at Gatwick Airport, futuristic Reading and Newton Abbot to reach Paignton (£20.80 from the GWR site, I refuse to buy from Southern on principle). The scenery beyond Exeter being wonderful. Arriving at the flat Torbay town, first sight was of a forlorn Lydham Manor outside the Dartmouth Railway station, which is just a level crossing hop from the mainline station. So, on to the Brampton Guesthouse and my £25 a night single room (with shared shower room and loo)! After a walk down to the pier and a couple of pints of dark ale with fish and chips at the Talk of the Town Wetherspoon's, it was off to bed. 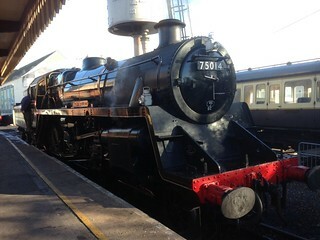 Saturday, after a superb fried breakfast, I wandered into town to get the 10.30 steam train. This stretch of the Dart Valley wasn't going to be running on Sunday. 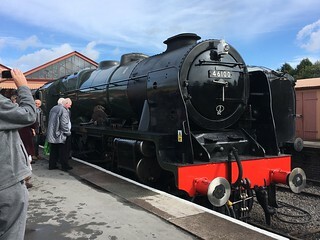 It was hauled by Standard Class 4 75014 Braveheart - why? cos it used to do the Fort William to Mallaig run when the film was being made. 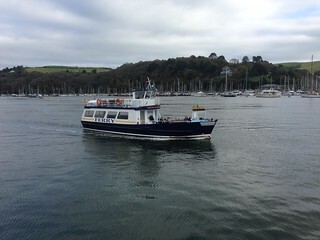 This carried us down to Kingswear, where we got an included ferry ride to Dartmouth (£15.75 concession), a charming town with posh delis and artesan markets. After chasing a few Pokemons I re-crossed the river on the proper ferry this time (the first leg was on a cruise boat helping out). 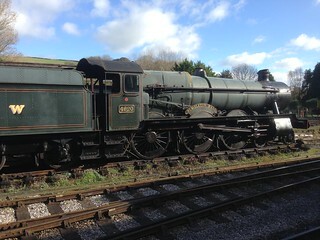 Braveheart was the only loco running, so back at Paignton I hopped on a 12 bus and went to visit Brixham. When I were a lad my dad drove us down to Torquay in his Commer van - no motorways, it must have taken days! 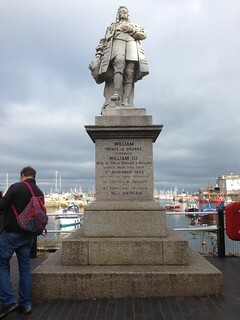 I remember visiting Brixham, and seeing the William of Orange statue (tho I though he was on a horse!). I tried to find a decent crab sandwich to no avail, so got the bus back and continued on to Torquay, where after a stroll round the harbour, found the Green Ginger Wetherspoon's for a well earned pint. Back at Paignton I popped into Lidl for some sustenance and went back to the B&B to watch Casualty. 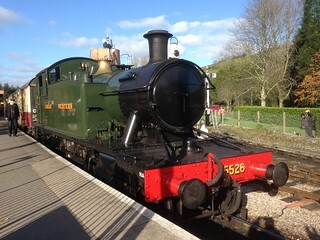 Sunday's journey to the other Dart Valley line, the South Devon Railway was a little more complicated. I established that the hourly Stagecoach Gold bus (wot, no number?) went to Totnes, but not very near the station. 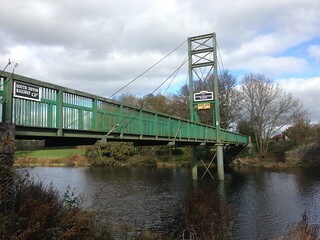 As it happened, it stopped more or less opposite, but it was a longish walk to the station via some woods and a footbridge. 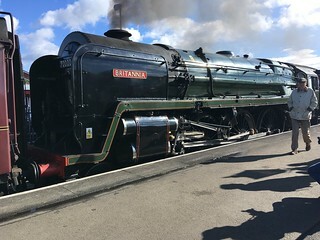 It was a surprise to see a pannier tank in London Transport livery No L.92, and this took us in Great Western splendour up to Buckfastleigh. On the way we passed the other loco, a Prairie tank No. 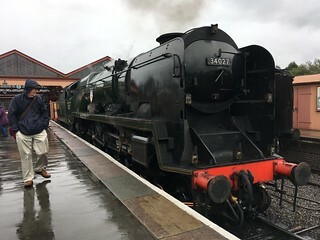 5526, which after a pasty in the refreshment rooms I travelled back to Totnes behind (my ticket granted me freedom of the line all day). I thought I might be able to catch a bus from Buckfastleigh, in fact a red London bus had been doing tours of the town and abbey all day, but had finished by the time I walked up to the main road to see what I could find. 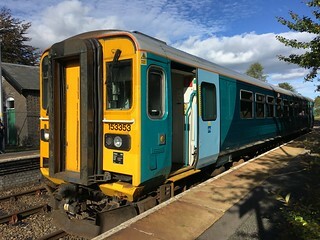 No luck, no bus for ages, so I walked back down to the station to get the last train to Totnes, and... it was being hauled by the diesel! 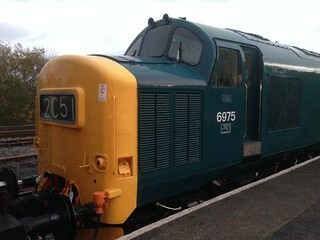 A Class 37 No. 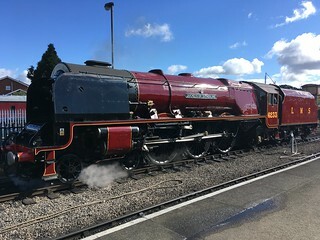 6975. A big plus point was that I could travel back in the observation car! Back at Totnes it was getting dark so I trudged back to the mainline station and bought a ticket to Paignton via Newton Abbot, only to find my Senior railcard had expired! Had there not been a fast train in, I'd have renewed there and then to enjoy my discount... ah well. Back at Paignton it was straight to the Wetherspoon's for a well earned pint! Again, no more than a listing of shows seen. Tuesday 22 August: to Waverley by train via St Pancras (£31.70). 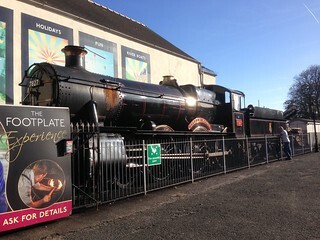 Spotted Flying Scotsman outside the NRM York. Pint in Cloisters bar and night in, watching me watching the Middleton Pace-Eggers on a TV programme about Utopias. Wednesday 23 August: to the BBC area to queue for The Now Show (Punt and Dennis) tickets, no luck. Gallery (mini)Bus to Museum of Modern Art Two for True to Life: British Realist Painting in the 1920s and 1930s. 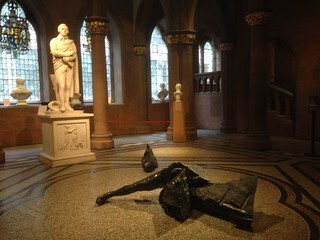 Superb exhibition if you like this period of deeply unfashionable art, which I do! 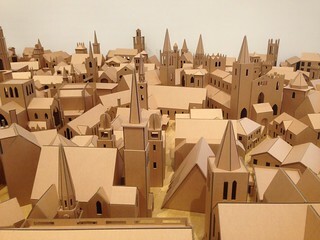 Across to One for small exhibition of Ed Ruscha and cardboard churches by Nathan Coley. To Fruitmarket for Jac Leirner Add it up, a sort of Martin Creed thing using everyday objects arranged to make art. To the Standing Order for a Wetherspoon's pint, and to Sandy Bell's, to catch up with Peter Chrisp. 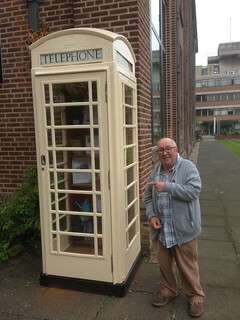 Then into the stand-by queue at the BBC for Punt and Dennis radio show and I got in! Doug Anthony All-Stars were one of the guest acts. 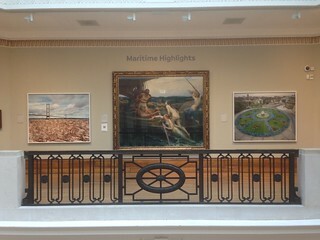 Thursday 24 August: £4 day bus ticket to Summerhall to see the art. Not impressed. To Talbot Rice, ditto. Bus back to Tollcross and a coffee and custard tart at Colony. To King's Theatre for Jarvis Cocker's Room 29, a musical about Hollywood, with Chilly Gonzales and the Kaiser String Quartet. 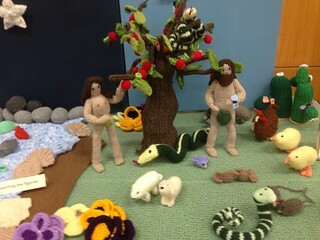 Friday 25 August: Bus to Nicholson Square, popped into the Knitted Bible Story at the Salvation Army and Sue Perkins Live! 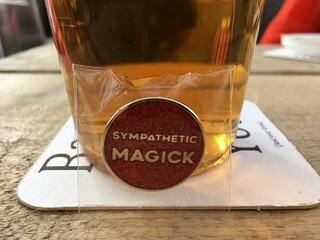 in Spectacles at Pleasance Grand, then after a beer in the courtyard, Nick Helm's very sweary Masterworks in progress '17. To George Square for a cullan skink pie and mash and a walk back to the flat. Saturday 26 August: day off! Bus to St Andrew's Square to meet Mad, then train to Drem and bus for the National Museum of Flight. 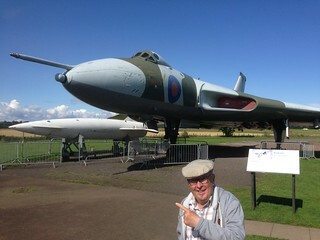 There I was reunited with Concorde G-BOAA and a Vulcan amongst other treasures, including a Lego event. Bus to North Berwick, train, and a Korean meal at Ong Gie back at Tollcross. 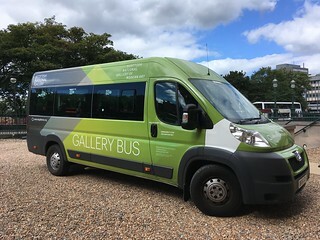 Sunday 27 August: Bus to National Library for film about Staffa and Shackleton exhibition, thence to City Art Gallery for Edinburgh Alphabet, a miscellany of stuff from the archives. 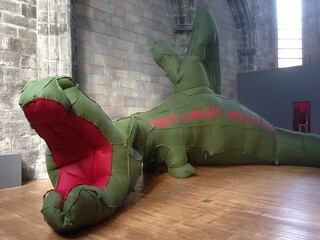 Visited the green Dragon of Profit and Private Ownership at Trinity Apse, and Al Murray's The pub landlord's saloon at the Speiegeltent Palais du Variete. Don't sit at the front! His guests were... The Doug Anthony All-Stars doing the same song as at the BBC! Pizza at the Wildman then to the Festival Theatre Studio for Martin Creed himself with Words and music singing twee Ivor Cutler style songs to an electric guitar. Taxi home. Monday 28 August: Bus to Book Festival, and then to the Stand for Simon Munnery's Renegade Plumber. He never disappoints. To the Portrait Gallery for coffee and tram to West End and bus to the Pleasance for NewsRevue 2017 at Beyond. As you'd expect: songs and dances about current affairs competently done. Watched the end of festival fireworks from Sam's kitchen window! It's never dull in Hull. It has its own railway and its own telephone boxes. 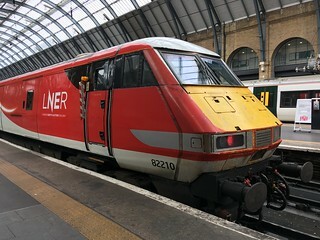 Tuesday 29 August: Train to Hull (£20.45). Walk to Haymarket, pint of Peanut Butter Stout at York Tap. Met at Hull Paragon station by Rick for a night in with trout. Wednesday 30 August: to University to see Philip Larkin exhibition New eyes each year at Brynmor Jones library: his books, his trousers, his cameras, his knick knacks. 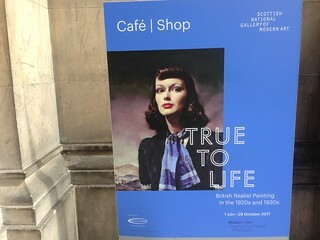 I was delighted to find next door a wonderful art gallery of mainly early 20th century art, and lots of self portraits. 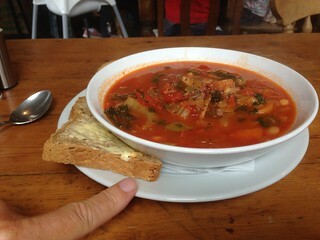 Hearty soup at Zoo, then later to Ambiente in the Fruitmarket for tapas and to the Freedom Festival Tent for Counting Sheep Revolution: a guerrilla folk opera, a Ukrainian immersive experience with lots of songs. Thankfully I wasn't dragged into the country dancing. Thursday 31 August: Park by Premier Inn for walk round the Fruitmarket and Humber Street Gallery. Check in at Royal Hotel for the night. Walk up to Ferens Art Gallery (Mr Ferens didn't like the Pre-Raphaelites, too modern! 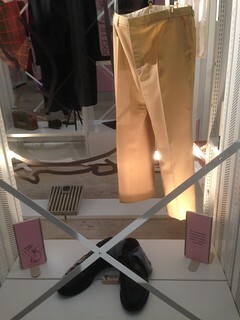 Missed the Skin exhibition. Then across the square to the Maritime Museum and a pint of Old Moor's Porter at the Wetherspoon's The Admiral of the Humber. Picked up from hotel and to the George Street Car Park for Ragroof Theatre's Bridges y Puentes, another immersive, this time about immigration and written by Dorothy Max. Got a passport! Then rush to festival tent transformed for a Freedom Festival Gala evening with entertainment by Slightly Fat Features, a troupe of comedy jugglers, champagne, wine and a veggie lunch box.